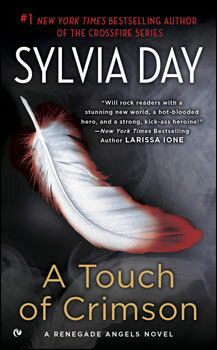 SylviaDay.com is celebrating A Touch of Crimson, book 1 of the Renegade Angels series. Enjoy some new downloadable background art and a couple of never-before-published book facts straight from Sylvia’s desk. BONUS: for the first time, Chapters 1 and 2 in their entirety, the longest excerpt for the story of Adrian and Lindsay and their immortal love ever published online. Enjoy the spotlight!